Ford Mustang is a car that requires no introduction. Mustang has a legacy of more than 50 years. With the Sixth Generation, Ford made a Right-Hand Wheel Drive Version that was launched in India in 2016. It looks strikingly stylish from the exteriors but the interiors are not stylish enough like its Rivals Audi TT and Mercedes Benz SLC but still is much more popular than those two cars. Its Presence on the road is just Phenomenal. It is the most popular sports coupe that has sold more than 9 million units worldwide. The most striking feature of the Mustang that everyone has loved since the 1960s is the way how it looks. It is a Pure American Muscle Car. 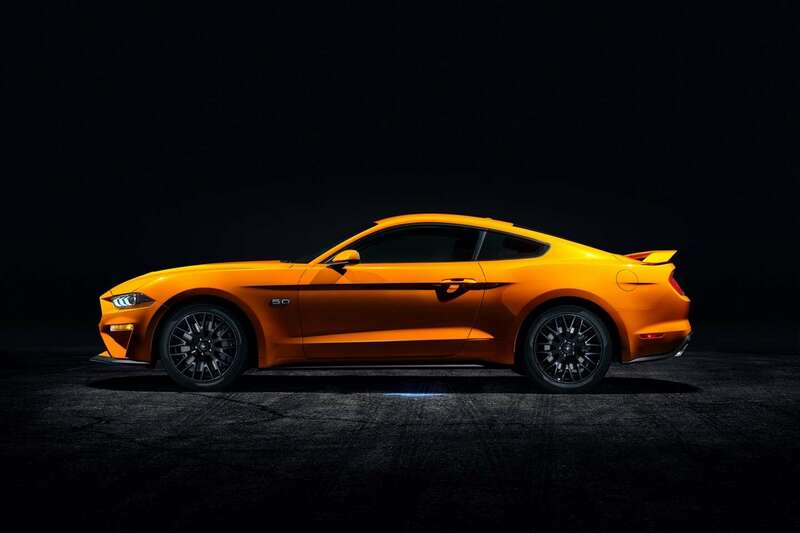 The Sixth Generation Model brings back the essence of the Classic 60s Mustang which was the best looking of the lot. The front end is beautifully dominated by a huge grille with the Mustang badge shining in the middle. The pronounced and thick ridges add to the muscular character of the Mustang. The Angular Headlights looks very aggressive with signature LED DRLs, 19-inch wheels with gloss black finish and at the rear – three slats LED tail lights, and the GT Badge sitting on the center of the black section gives the car a racy appearance. There are 6 colors on options – White, Silver, Yellow, Dark Grey, Red & Black. Red is the most attractive looking and a sure head turner. The All-black Interior is inspired by a classic aeroplane cockpit even the Speedometer reads ‘Groundspeed’. The metal and chrome bits are present all inside the cabin, toggle switches, Borderless Windows and the bucket seats are some classic features. The Interiors are comfy and a nice place to be in and looks different. All the controls are well within reach. Quality of materials used, especially the hard plastics aren’t as good as the competition. 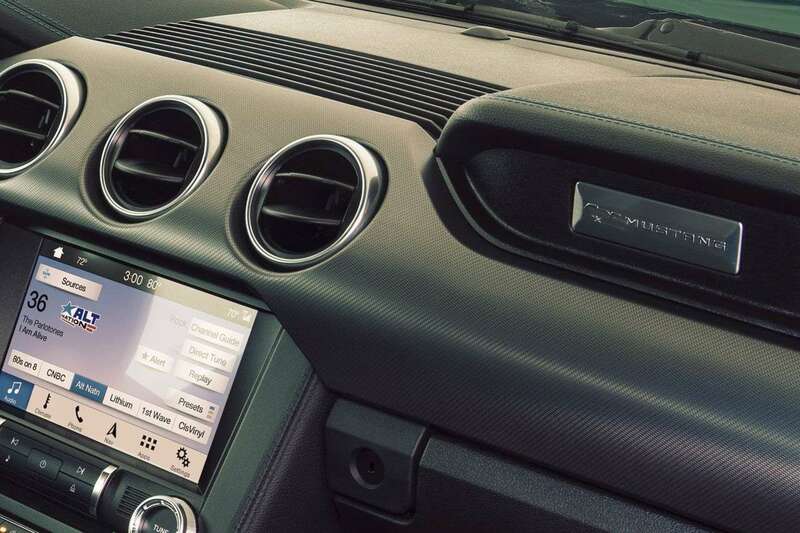 But the Mustang character is pure ruggedness and that holds true inside the cabin as well. The Ford Mustang offers a 2+2 seating configuration so there are rear seats too and they can fold also. Head-room is low due to the sloping roof. 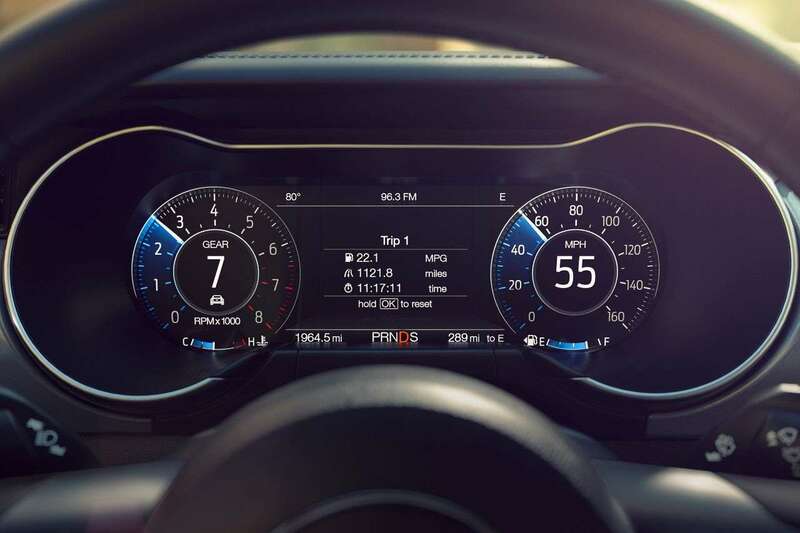 The Mustang also has an electronic line-lock that helps in doing burnouts, an 8-inch SYNC 3 infotainment system which is very smooth, crisp, clear and is offered with Android Auto and Apple CarPlay. In terms of practicality, 320 liters of Boot Space on offer with Cup Holders for the Passenger and Co-Passenger. The Indian Mustang is graced with the Iconic Naturally Aspirated 5.0 Litre V8 Engine. The V8 puts out 401PS of Power with 515Nm of Torque. The Growl from the Motor sure is a soothing noise to the enthusiasts. The Mustang has four selectable driving modes – Normal, Sport+, Track, and Snow/Wet. In Sport+, the engine is allowed to rev more and feels much more responsive too but it is let down by the slow 6-speed automatic gearbox. However, the fun is in how the Mustang accelerates. Put the pedal down and the car will shoot forward. Ford Claims that it can do 0-100KMPH in under 5 Seconds. The Handling has improved from before too but body roll at those sharp corners is evident. The Motor will Guzzle all the fuel from its 60.9-liter fuel tank soon if you keep on driving it hard. The ARAI fuel efficiency is around 13KMPL but in normal driving conditions should return around 5-7 KMPL and in case of Rash Driving could be as low as 3 KMPL. Talking about the Braking, Discs all round helps in providing a decent amount of stopping power. The steering is a delight to use, it has the right amount of weight and good feedback from the road and is nicely weighted for the everyday driving too. 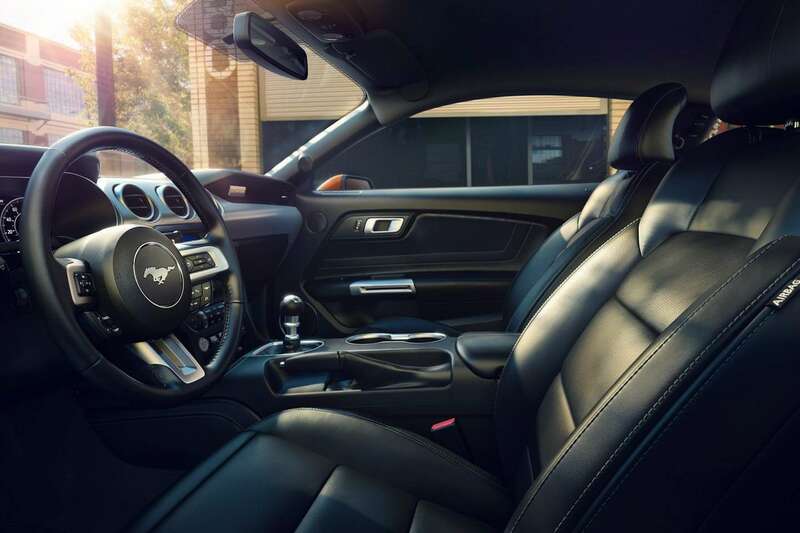 The Ford Mustang in India offers eight airbags, including passenger knee airbag, ABS, Electronic Stability Control and traction, programmable key and Isofix child seat anchors, among others, as safety features. It gets Rain-Sensing wipers, Heated and Cooled seats, eight airbags, reversing camera, Cruise Control, Hill-Launch assists, a Tyre pressure monitoring system, Auto-dimming rear view mirror, 9-speaker sound system with an amplifier, Pony Projection Puddle Lamps, Dual Zone Climate Control. Yes, The Indian Mustang is as Iconic and Muscular as Before. It has changed over the years. The 80s and 90s Mustang looked nothing like the Classic 60s Mustang but the Sixth Generation Model brings the classic look back with a new twist and loads of features. The Mustang will always be the most appealing American Muscle Car.